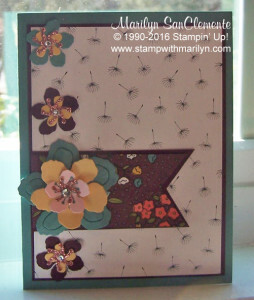 Earlier this week I posted a card that I had made with the Botanical Blooms stamp set and matching framelits using this week’s Mojo Monday sketch. Well I loved the card so much, I was thinking that I would make the same card but just change up the colors and Designer paper. Of course, life always gets in the way and I didn’t have time to work on the card until today. So here it is – my 2nd card using this week’s Mojo Monday sketch. the Cardstock base is Mint Macaron cut to 5 1/2″ x 8 1/2″ and scored at 4 1/4″. The Designer paper pattern is the Mint Macaron design cut to 3 3/4″ x 5″. This is layered onto a piece of Whisper white cardstock cut to 5 1/8″ x 3 7/8″. The banner for this card is a piece of designer paper cut to 1 1/2″ x 3″ and layered onto a piece of Hello Honey cardstock that is 1 5/8″ x 3 1/8″. 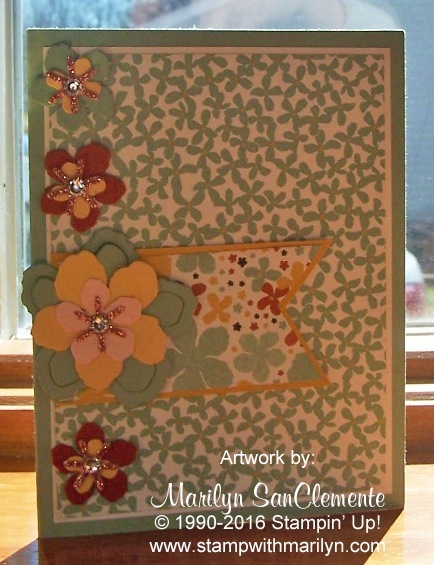 The Flowers are cut from Mint Macaron, Hello Honey, Pink Pirouette and Cajun Craze Cardstocks. I used a piece of Blushing Bride Glitter paper to cut the center of the flowers. I Then added a rhinestone jewel to the center to add bling.